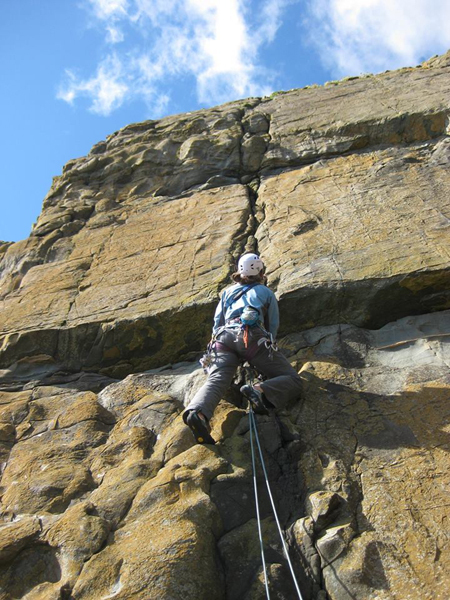 The photo above is of myself seconding the excellent Pinking Sheer, HVS at Little Zawn. After discovering that one of the belay stakes at the top of Red Slab had broken recently (at least partly due to corrosion), we placed two new stakes there in 2016. Thanks to Graeme for the angle-iron and hammering skills at Red Slab! Fox Craig -- Only one stake from about 2008, probably suspect. The other stake we placed in 2010 is no longer there (corroded?). There's a fence strainer nearby and an old c.1980 circular stake as well. Limehouse Blues -- One big circular stake, dates from the late 70's or early 80's. Little Zawn -- One thicker stake from about the 1980's, two thinner ones date from 2009. There's a fence strainer nearby, with a long rope to link these you'll have a good belay. Red Slab -- Two new stakes were placed summer 2016, at least 1m deep. The nearest fence strainer is loose. Don't be tempted to use the big boulder near the top of the rocky part of the routes, it moves! Deep Zawn -- One stake from 2008 remained in November 2017, but it has been removed by me as it was very badly corroded. There's a fence strainer nearby. Introduction Meikle Ross is a big area of sea cliffs near the town of Kirkcudbright, on the Solway Coast. There is a short 15 minute approach over dry farmland. This starts from a parking area at the end of the road on the south side of Ross Bay. The climbing is very mixed, some routes see little traffic and can be loose and scary, others are great, atmospheric sea cliff routes with top quality climbing. Access To get to the Ross follow the Borgue road out of Kirkcudbright (A755 then B727). Turn off left onto a minor road (signposted Brighouse Bay) about 2km after you pass the picnic area at the Doon beach. A short way down this road turn left again for Ross Bay, and follow this road to the end, past a farm and onto a farm track then past a few caravans to a small grassy parking area by a gate on the south side of Ross Bay. Follow the path across fields from here round to the top of the eastern cliffs. A big complex cliff area! In order, from the east, you'll reach the small area of Fox Craig opposite the lighthouse island, then the wee outcrop of Crab Slab low down by the sea under the huge and extremely scary Osfrontalis Wall. Next comes the biggest cliff, called Limehouse Blues, with a large arch/scoop low down, then the small and well hidden, but excellent, crag of Little Zawn. Further west across the wide, stony Slack Heugh Bay are the obvious Red Slab (it's a red slab!) followed by the fully tidal Deep Zawn. Beyond this to the west are some rather Scruffy Areas and the excellent wee slab of Old Zawn. Also of interest is the full sea level traverse of the Ross. 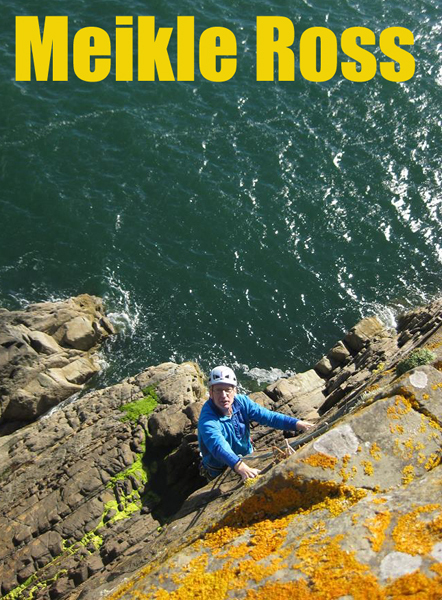 Included on this page are a few of the best routes at the cliffs that I have personal knowledge of. 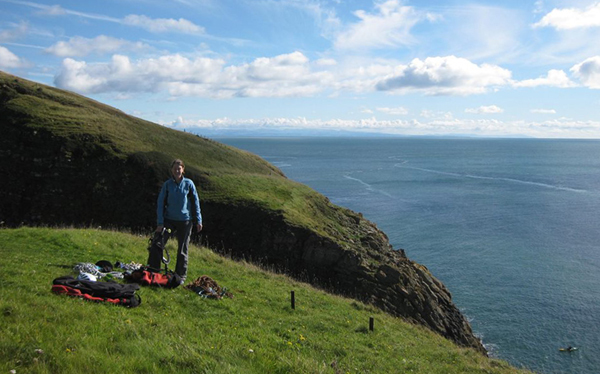 For a definitive list of all the climbs here see the SMC published Lowland Outcrops guidebook. For some routes an extra length of rope is required, or at least is very useful, to set up a belay from the in-situ stakes and/or the few remaining fence posts. Good routes for your first visit to The Ross. 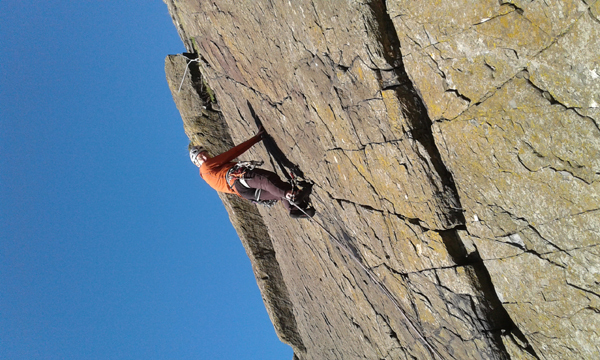 Climbing at Meikle Ross at its best is brilliant and idyllic, but it can be something of an acquired taste. Poor route choice on your first visit could easily put you off. So here are some recommendations for a first visit. Remember that it's advised to climb a grade or two below your normal level until you get the feel of the place. Try climbs like -- Promontory Wall, S or Twin Cracks, S on Fox Craig -- Any of the routes on Crab Slab (from D to HVS) -- Clockwork Orange, VD, Mellow Yellow, VS and Pinking Sheer HVS at Little Zawn -- Mental Block & Demolition Tango, both VS (and hard to start) or Wizard of Oz, S on Red Slab -- or if you want something more adventurous but still enjoyable, abseil in and climb out Rift Route or Eminence Grise (both S) on Deep Zawn. The most eastern crag, almost facing the Little Ross island, is the small Fox Craig. 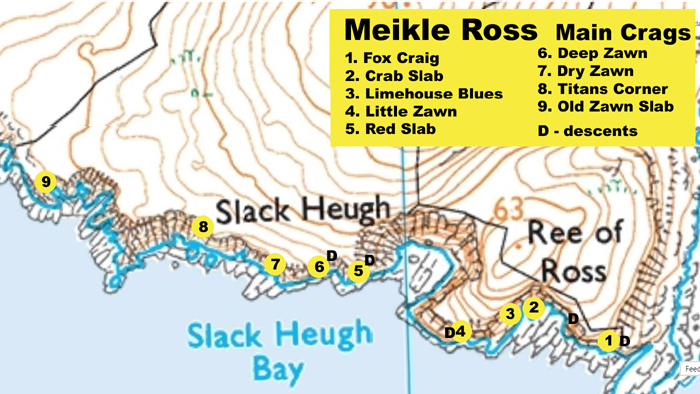 This is a good introductory crag to learn all about Meikle Ross..... in particular the cracked right hand Alligator Wall has a number of fine routes that are only slightly scary...! Descents are possible at either end, on grass and some very straightforward scrambling, traversing along the base between the east and west ends is about Moderate at high tide, easier at low tide. Pictured above is an overview of Fox Craig, seen from the sea. This shows the descent routes and one or two of the more isolated lines on the left. Some scary sounding E-routes have been done up those overhanging grooves, not detailed here for obvious reasons. Pictured below is a more detailed shot showing the routes on the 15m high Alligator Wall. 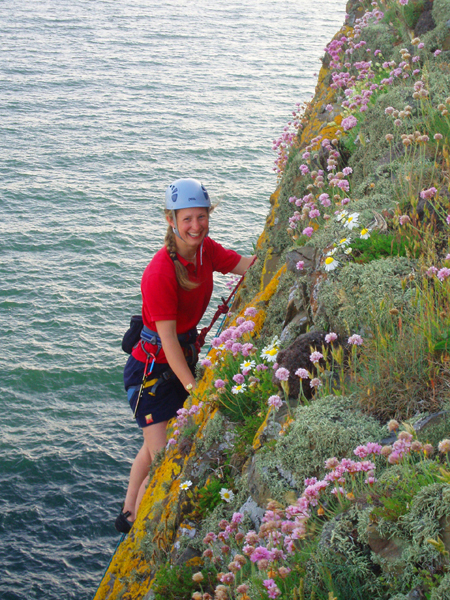 Kate climbing through the flowers on Twin Cracks at Fox Craig, Meikle Ross. A pleasant wee area just east of Limehouse Blues and somewhat dwarfed by that huge cliff, although the routes here are still 12-15m long..! The best access is down the grassy ramp at the west end of Fox Craig. This area has a nice base, good solid boulder belays at the top, generally reasonable protection and has routes from Mod. to HVS. Routes were first recorded and named in summer 2007, by myself, Ian and Kate Brown, Linda Biggar and David McNicol, although they had all probably been climbed earlier. Ian Brown on the first ascent of Mutant Slater, HS, September 2007. The slater, at least 5cm long, emerged from the crack into the sunlight and raced towards the top of the route ahead of Ian. The crag is generally non-tidal, although at very high tides or in very high seas the base might not be accessible. Descend the shallow gully (Easy) at the back of the slab or abseil from the blocks. Protection is from lots of small gear, nothing bigger than a Camlot 1 / Friend 2. The slab was named after the numerous crab body parts lying around at the top on our first day here. Arthropomorphic is particularly recommended, but micro cams (Camalot C3 - 0 or 00) in a horizontal break at 5m provide the only runners. Start at the small triangular niche (like an Up Elevator symbol). Runners on other routes are generally OK, mostly small to medium cams and wires. The next crag west is the massive Limehouse Blues cliff, with routes up to 60m long. Access is by walking along the beach westwards from Fox Craig at low tide, or by scrambling in from Little Zawn to the west at other tide states. There are many more routes on this crag than those described here... I just don't know them personally. All routes on this crag are likely to need some cleaning now, they have seen very little traffic for many years. 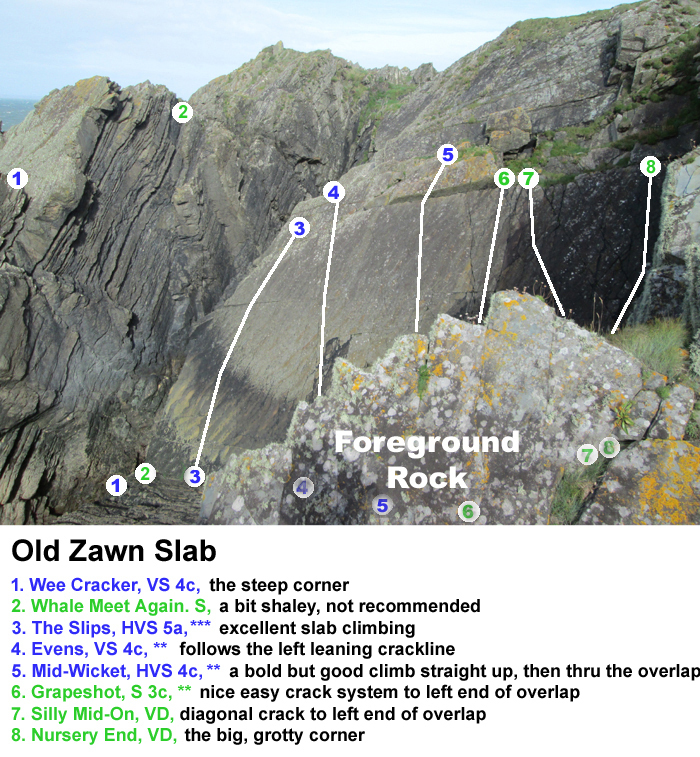 The next crag is the small hidden area of Little Zawn, with some excellent routes. 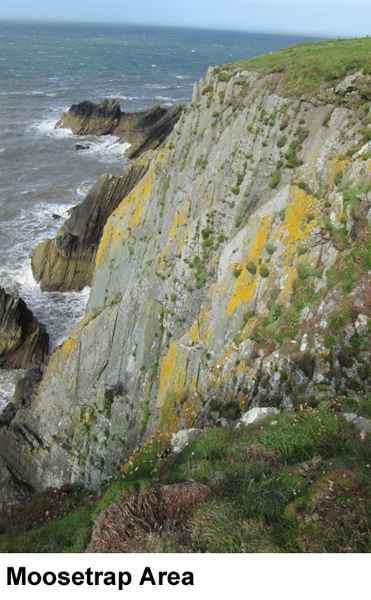 Access is by a short scramble from the west end above the high tide level, or abseil down the line of Mellow Yellow. As of September 2010 there is a new belay stake near the old fence at the top of the grassy scoop and two more stakes (one new, one old) about ten metres down and slightly left. Some extra rope may be useful to link these, but is not essential if you are climbing on 50m ropes. This area is recommended for a first time visit to the Ross. There are good routes at all grades, protection is generally good and loose rock is not as common as elsewhere. Mellow Yellow at Little Zawn, September 2015. Further west, on the far side of the broad shingle beach of Slack Heugh Bay is the Red Slab. This has some nice routes, all about 30m long. To reach all of the routes on the Red Slab descend the steep and sometimes slippery grass on the left (looking out). There are two new belay stakes at the top of the routes (placed summer 2016, at least one metre deep). The routes on the left are generally on OK rock, but take care higher up. Those in the centre, particularly BMW, Cairns Cream and Grand Central Couloir, have some very poor rock/grass at the top and you might do well to leave a fixed safety line to protect the top 10m if leading them. GCC is in fact so bad it's not described here. The classic Mental Block and neighbouring Demolition Tango have a (shared) solid finish. Climb Mental Bock by heading up right of the block, traversing left onto it, and then traversing off it leftwards again, to join Demolition Tango - this avoids an area of poor rock directly above the block. Beautiful scenery at the top of the Red Slab, Meikle Ross. Looking over to St. Bees Head and the Lake District. Spot the kayaker.! 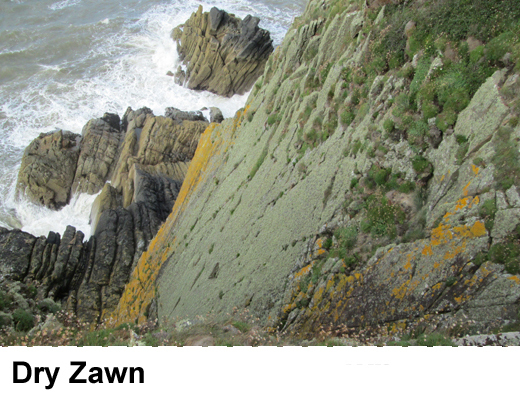 The next crag west is the 50m high Deep Zawn. This is the only fully tidal cliff at the Ross, marked on its right hand end by the distinctive gash of The Rift. To reach all of the routes on the Deep Zawn descend the steep rock and grass ramp from near the belay stakes going down rightwards (looking out). There is some scrambling on this descent, and the traverse back along the bottom of the cliff above the sea to reach the routes is about Diff. There are no belay stakes a the top of this crag. West of Deep Zawn are a few very vegetated areas. These would only be worth climbing on again after extensive cleaning... because the climbing was reported to be good once upon a time. Photos of a few of these areas appear below, going east to west. The first area, just 50m west of Deep Zawn, is called Dry Zawn. Very vegetated. Access as for Deep Zawn by abseil or by the ramp. Next up, is the equally vegetated Moosetrap area. Then comes Titan's Corner area. Descent is by abseil, there are two big strainer posts and an old iron stake near the top. 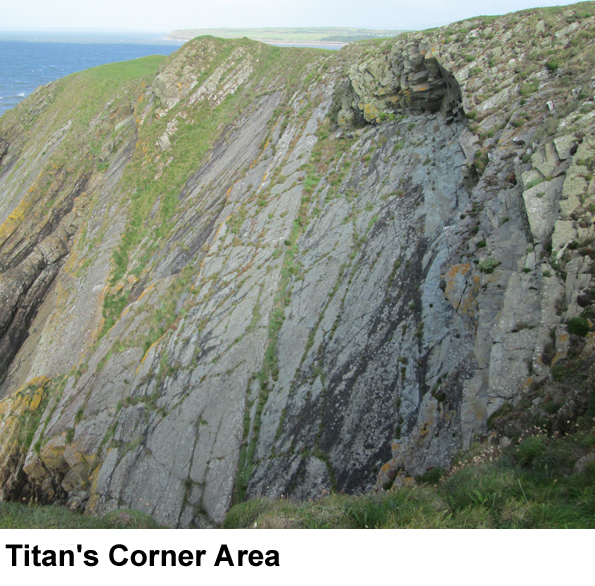 Titan's Corner is about 150m west of Deep Zawn. Titan's Corner itself was reputedly a very good E1 that climbs the big corner underneath the overlaps on the right, finishing steeply through the left end of the overlaps. There were several old Severe and VS routes on the slab itself. This final area at the west end of Meikle Ross is much better and not too vegetated. For Meikle Ross it has generally very good rock. It is best reached from the road by walking around the north and west of the hill. If you're coming from the Red Slab area it is about 200m beyond Titan's Corner, 350m in total from Deep Zawn. There are two old strainer posts at the top of the crag which can be used to abseil, 60m of rope is needed to set this up. Otherwise you can climb down the wee gully immediately to the west of the crag. There is an easy but exposed/awkward step at the bottom which will be nasty when wet. Climbing Grapeshot at Old Zawn, October 2016. The full sea level traverse of the Ross is best done east to west when the tide is about three-quarters in. At this state of the tide the 2m downhill jump across The Rift will be safest, with a merely wet and salty landing (rather than painful) if you blow it! This jump is definitely the psychological crux, the technical crux is about 4b or 4c and is on a small slab further west. Fox Craig to Limehouse Blues -- Walking and some Moderate scrambling. Limehouse Blues to Little Zawn and beyond -- Moderate scrambling. Slack Heugh Bay and around the base of Red Slab -- Walk. Red Slab to the Rift -- Moderate scrambling. Jump The Rift -- Landing on a barnacle ledge about 1m below the barnacle line. A pendulum abseil may be possible, but good anchors have so far proved hard to find. Or you can traverse up and over the rift at about 4b! Traverse of Deep Zawn -- Diff climbing, the most enjoyable and exposed section. Further west - a lot more walking and scrambling with occasional moves to 4b/4c completes the traverse.